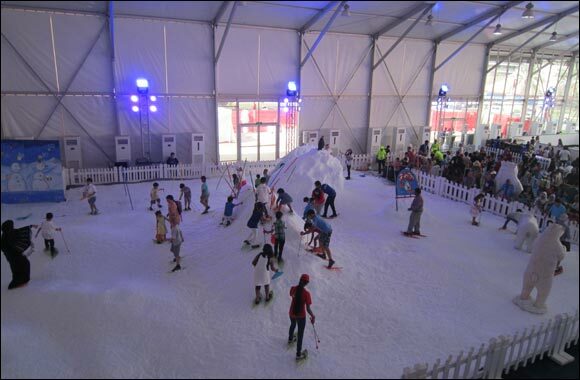 United Arab Emirates, June 5, 2015 – The Snow Village established by the French company Eversnow during the Formula 1 Grand Pix in Bahrain, last April 2015, has attracted a large public. Several medias reported interviews with the CEO, Bertrand Lambla, who received many requests from events professionals. He seeks partner investors in order to develop its entertainment’s brand in the Gulf and Asia regions. His snow garden of 2000 Sqm might be invited to the car race in Abu Dhabi and can be established for a few weeks in Saudi Arabia. The sandstorm and the high temperatures don’t affect the technical prowess of the French company Eversnow. It strengthens rightly their research on performance, especially those concerning the enhancement of the condenser’s power. The acclimatized tent represents a refuge for the children and their parents. It has also attracted officials such as His Royal HighnessH.R.H Prince Salmane bin Hamad Al Khalifa, the crown prince. Due to the big satisfaction of Sheikh Salman bin Isa Al Khalifa, CEO of Bahrein International Circuit and silent partner of this unusual entertainment, VIP’s of F1 were also enthusiastic about this innovation: Bernie Ecclestone head of FOCA and financial responsible of Formula 1 or Niki Lauda triple world champion of formula 1 and non-executive president of the Mercedes team. This event which has never taken place in the Middle East is a challenge from the production and achievement points of view.. The fulfillment of this concept is now planned for Dubai, Saudi Arabia and several Asian countries. This snow amazed so many persons especially among the Bahraini children: « I had never seen the snow », « It’s the first time I make a snow ball », « I was able to test the Nordic skiing ». The flagship attraction of the Bahrein circuit has gained its fame in the region with this event. The French company Eversnow hopes to export its Know-how during specific events or to participate in events more durable for the large public. Other events lie ahead for the company in Asia since October 2015.